This element is defined with a credit balance. This element is also equivalent to a loss, which a filer may want to represent as an expense in the income statement. The element to represent the loss, however, needs to be a debit. Should the value of this element be defined with a negative value to represent the expense? In the case where an element is defined in a roll-forward from the perspective of defining the impact on the balance sheet, the value should be entered as a positive amount. If the same value is reported in the income statement to represent an expense or income item, the value should not be entered as a negative amount. In those cases, the expense or income element should be defined as an extension element if it does not already exist in the taxonomy. However, an expense or income item can be included in a roll-forward without creating an equivalent roll-forward element as an extension. The reason extensions are not required is because all roll-forwards defined in the US GAAP taxonomy do not assign a balance attribute to the aggregate change during the period. These aggregate amounts are usually defined as an increase/decrease element at the bottom of the roll-forward. The removal of the balance attribute on the aggregations means that a calculation can be defined combining elements from the income statement and cash flows in the roll-forward. 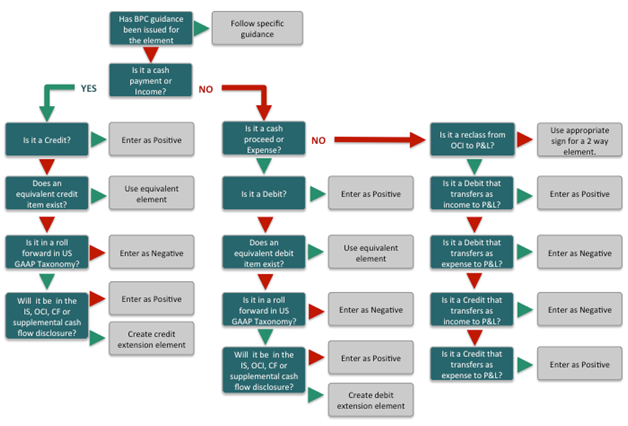 The following flow shows the decision tree to follow associated with two-way elements. This decision tree should only be used for elements that are duration period type. For example the element ProceedsFromShortTermDebt is a cash proceed, so the right-hand side of the chart is followed. The first question is if the item is a debit. If it is, then it is tagged with a positive value. The element “LossContingencyRelatedReceivableCarryingValueReceipts” has a balance type of credit in the taxonomy. The element is a receipt and represents a cash inflow. This means that right hand side of the flow chart is followed. Because the item is a credit and is in a roll forward it should be entered as a positive in the roll forward. If required in the cash flow statement then an extension element should be created. Do not use this element in the statement of cash flows with a negative amount as this element represents the impact of cash on contingencies and not the actual cash flow. In summary, an element in the income statement or statement of comprehensive income can be used in a roll forward, but an element that only appears in a roll forward necessitates use of an extension element for the corresponding other side of the entry reported elsewhere.